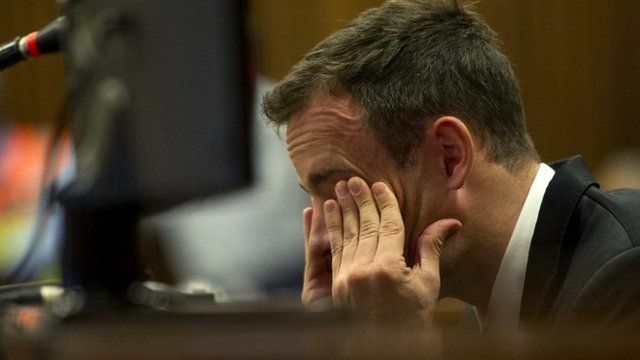 Pistorius murder trial postponed Jump to media player The judge in the Oscar Pistorius murder trial has adjourned the case until 7 April because one of the court officials is unwell. Pistorius 'scared' his girlfriend Jump to media player Oscar Pistorius' girlfriend Reeva Steenkamp sent him a text message saying: "I'm scared of you sometimes," his murder trial has heard. Pistorius 'on stumps' when he fired Jump to media player A key police ballistics experts says Oscar Pistorius was not wearing his prosthetic legs when he opened fire on his girlfriend, Reeva Steenkamp. An emotional Oscar Pistorius has appeared in the witness box for the first time, as his murder trial resumed in Pretoria, South Africa. He began his evidence with an apology to Reeva Steenkamp's family, saying he was "simply trying to protect" her, and later told the court he was "scared to sleep" and suffered from "terrible nightmares". TV camera crews in the court had been asked not to show Pistorius as he gave evidence from the witness box. State prosecutors allege the killing on Valentine's' Day 2013 was premeditated, but Mr Pistorius claims he mistook his girlfriend for an intruder.